Forum on Wednesday, November 19th at Rapson Hall Atrium on the Minneapolis Campus. River Journey leader, Jonee Kulman Brigham, participated in the GIS table display area to discuss the role of maps in Earth Systems Journey--the model being used for the River Journey project at River's Edge Academy. River Journey is using GIS (geographic information system) digital mapping software called ArcGISonline to create "story maps," which software publisher, ESRI describes this way: "Story maps use geography as a means of organizing and presenting information. They tell the story of a place, event, issue, trend, or pattern in a geographic context. They combine interactive maps with other rich content—text, photos, video, and audio—within user experiences that are basic and intuitive." Assisted by U-Spatial, students are creating story maps about their river journey, using images of the places they visited to reflect on the values represented. 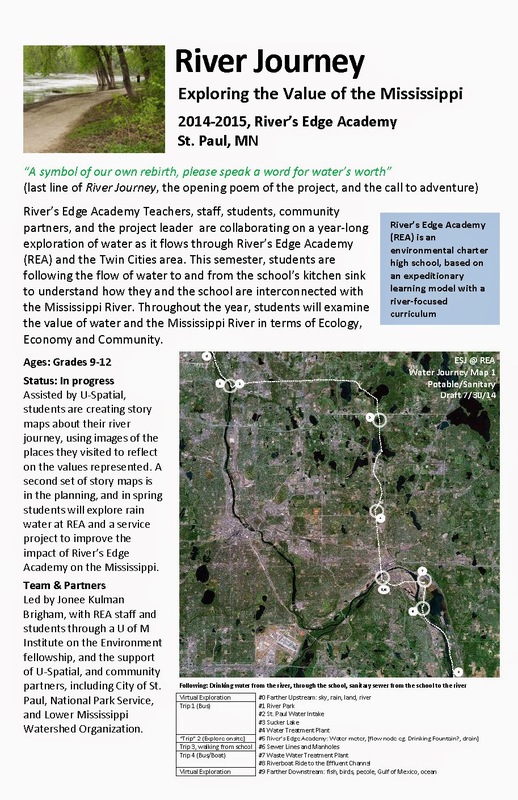 A second set of story maps is in the planning, and in spring students will explore rain water at REA and a service project to improve the impact of River’s Edge Academy on the Mississippi. For River Journey, the collaborative team chose story maps as the primary learning “product” for the yearlong project. In the prior year, students had jointly created a field guide to the superior hiking trail as a learning/service project and so the idea of creating and publishing an online interpretive maps, was a natural outgrowth of the schools use of fieldwork for hands-on and public service learning approaches. 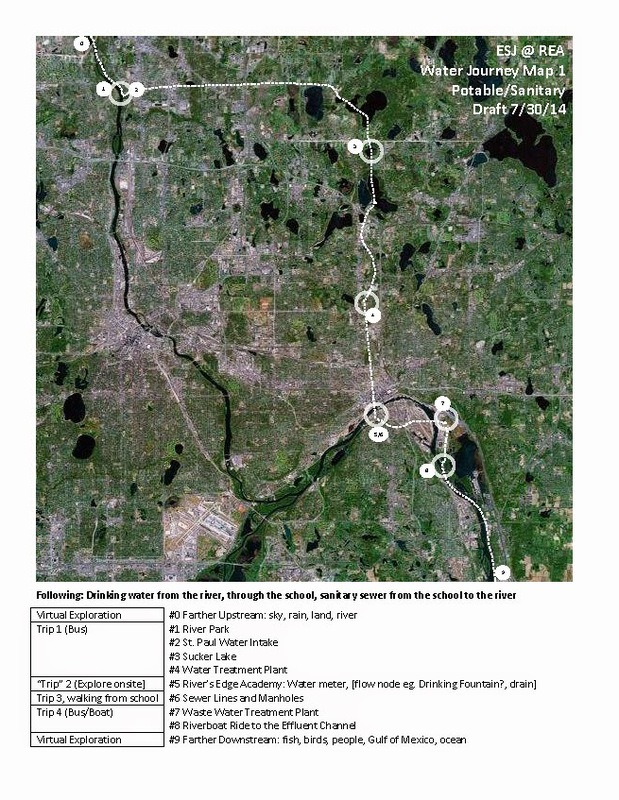 At the launch of the project, students learned that they would spend the year learning about how their school is connected to the man-made and natural water cycle of the Twin Cities, and would create story maps to demonstrate their learning and contribute to public understanding of the water system. Students reviewed a variety of story maps by other organizations, and were asked to collect images and build a body of reflections during their journey fieldwork, for later use in their story maps. After introducing the team to GIS, U Spatial worked with the school to plan the student training and assignment. Second Set of Story Maps: In the coming months, students will work with Brian Goodspeed, park ranger with the National Park Service to create another set of story maps that delve more deeply into the opportunities for map based research, analysis, and exploration of values. The journey has begun! The River Journey project is under way at River's Edge Academy. Teachers, staff, students, community partners, and the project coordinator are collaborating on a year-long exploration of water as it flows through River’s Edge and the Twin Cities area. This semester, students are tracing the flow of water to and from the school’s kitchen sink to understand how they and the school are interconnected with the Mississippi River. After an introduction to the project on August 27th, students spent two days traveling upstream from the school to the water supply intake pumps at Fridley where St. Paul gets its drinking water from the Mississippi River. They visited the lakes the water passes through, and toured the water treatment plant where the water is transformed into tap water. The students also studied different ways of seeing and using the river and the values those uses represent considering community, culture, economy, and ecological values. September 15th and 16th, students canoed the river with Outward Bound and passed the intake pumps they had visited in August. The students explored water and sewer systems near and within the school, measured water use from hand-washing, toilet flushing, and drinking fountains, and considered how to save water and money by conserving water at school and home. September 24th was an all school boat tour to the channel near Pig’s Eye Lake, where sewer water returns to the river after treatment. During the boat ride, students continued their study of values and the river, presenting to teachers and their peers the history of the sometimes conflicting ideas about how the river should be used. In October, students will visit the waste water treatment plant and Kaposia Landing to conclude the expedition phase of the project, which sets the groundwork for the next two phases: 1. Creation of a public online map about the river and water use in their school based on student creative work and research, and 2. a spring exploration of rain water at REA and a service project to improve the impact of River’s Edge on the Mississippi. River Journey is coordinated by Jonee Brigham, through a fellowship from the Institute on the Environment at the U of MN, and with the support of many community partners. 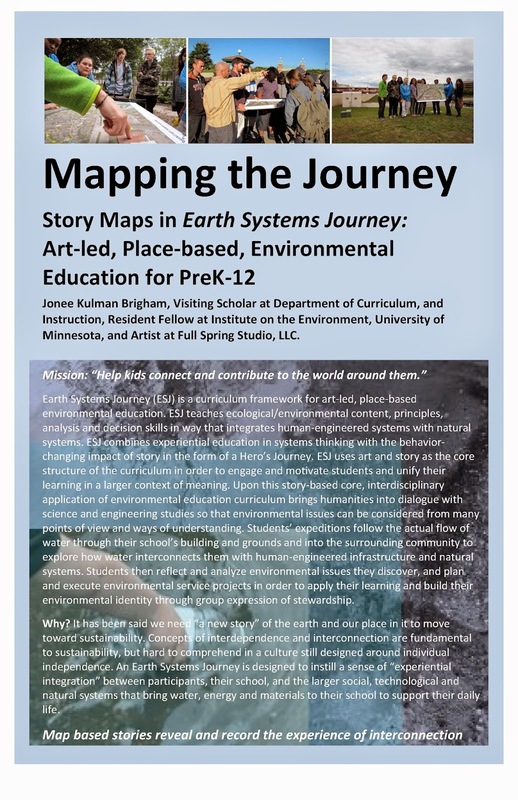 The project is based on a model Brigham developed for art-led environmental education called Earth Systems Journey. See http://earthsystemsjourney.com for more about the model. Welcome to the River Journey website, where you can learn about the project background and ongoing activities. We welcome your comments and questions!